Simple 1 Button Toner Operation. Sturdy Cloth Covered Toner Leads w/RJ11. Up to 4 miles range. 5 User Selectable Volume Levels. The Pro220K Tone and Probe Kit is a robust, waterproof wire identification tool designed for adverse operating conditions. 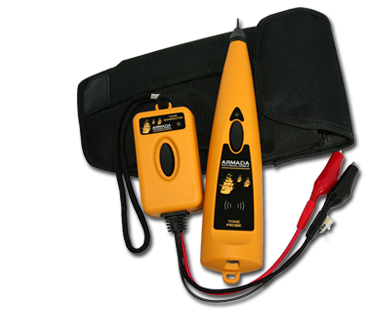 Transmitting a common 1Khz analog tracing signal and interchangeable with common tone and probe kits, durability sets the Pro220K apart from its competitors. Extra thick polypropylene housings, grommited seals, durable cloth leads, and detachable alligator clips make the Pro220K stand out from the crowd. Additional features include low battery indication, polarity, and impedence. The Pro-220K is a durable, reliable tone and probe kit designed for identifying the termination point of any wire. Used in the irrigation world, a contractor would use this kit for identifying where a particular solenoid is connected into the clock or controller. The tone sender is connected to the wire at the solenoid and activated. The banana probe is then taken to the clock and used to locate the beep-beep-beep signal. The wire making the loudest signal is the one connected to that solenoid and therefore that zones wiring is identified.